“Crisis or no, nothing should interfere with tea!” said David Niven, as Phileas Fogg, the perfect English gentleman, when facing another emergency. That line, from Around the World in 80 Days (1956) fit the actor known for his light comedy touch. He also showed a serious spirit in Separate Tables (1958), and won the Academy Award for Best Actor. And as for English, he was also Scottish, French, and Welsh. 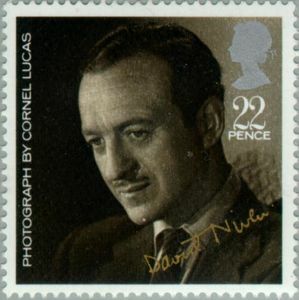 James David Graham Niven was born on St. David’s Day, 1 March 1910, in London. The name “David” was a birthday present from his mother, Henrietta Degacher, one-quarter Welsh. His Scottish father, Lt. William Niven of the Berkshire Yeomanry, died in August 1915 at Gallipoli in World War I. His grandfather, William Degacher, also died in battle, at Isandlwana in January 1879 in the Anglo-Zulu War. David followed family tradition, graduating Sandhurst in 1930 and joining the Highland Light Infantry. Acting suited him better. He tried movie bit parts in Britain, resigned his commission, and crossed the Atlantic, intent on a film career. His turn as Able-bodied Seaman in Mutiny on the Bounty (1935) got him a contract with producer Samuel Goldwyn, leading to roles co-starring with Errol Flynn in Dawn Patrol (1938) and Merle Oberon and Laurence Olivier in Wuthering Heights (1939). Then came World War II. His autobiography, The Moon’s a Balloon (1971), was a best seller. His follow up, Bring on the Empty Horses (1975), reminiscences from Hollywood, appropriated more than a few stories from other people. Apparently, Niven still was the “crown prince of charm” even when his exploits weren’t his own. Or, as his son David Jr. explained, “Sometimes, if you told him an amusing story, you would later hear him retelling it as if it had happened to him, only this time it was far more amusing.” What was not amusing was his diagnosis of ALS, “Lou Gehrig’s Disease,” that, on 29 July 1983, ended all the charming stories.